This gluten-free cake has a festive air and could be served at Christmas or another wintry celebration. Few people will guess it contains aubergine which adds moisture and a silky smooth texture. To make one cake you will need a loose-based cake tin 23 cm diameter and 7 cm deep, or for small cakes a 12-hole cake or muffin tray. Line the cake tin with non-stick baking parchment and brush lightly with oil. Or fill the muffin tin with small paper muffin cases. Puncture the aubergine all over with a skewer, place in a bowl, cover with cling film (plastic wrap) and cook in a microwave on high for 5 minutes until soft. Throw away any liquid that has accumulated and leave to cool a little. Skin the aubergine and purée with a stick blender or liquidiser. Add the broken-up chocolate, which will melt in the warmth of the aubergine. Place the remaining ingredients apart from the cranberries and caster sugar in a large bowl and mix thoroughly. Stir in the aubergine mixture and half the cranberries. Pour into the prepared tin or cases and bake a large cake for 40 minutes and small cakes for 20 minutes. Remove from the oven and cool for 15 minutes before turning out on to a cooling tray. 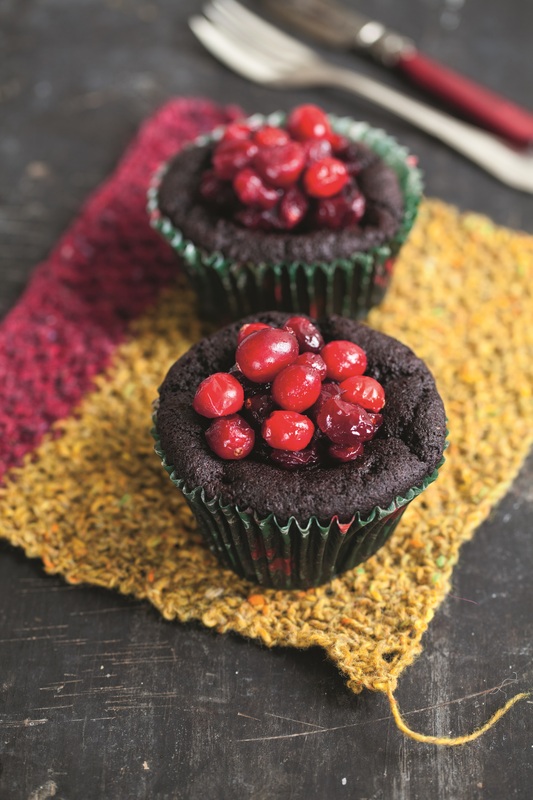 Place the remaining cranberries in a small bowl with the caster sugar and cook in the microwave on high for 1 minute. Use these to decorate the cake(s).